We hope you had a great thanksgiving yesterday...may God be praised! 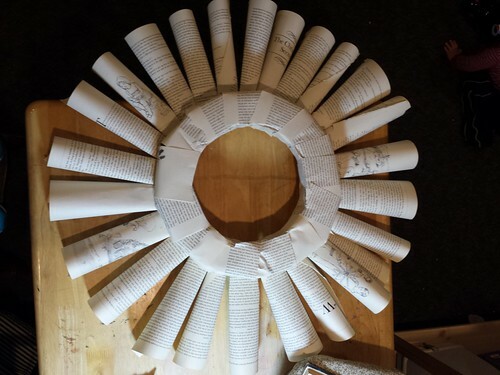 Thanks for popping in with us today for the final week of Deck the Walls: a wreath-along in which we worked on making a doable, frugal Book Page Wreath in small steps over the month of November. (Here is a recap...Week 1, Week 2, Week 3). 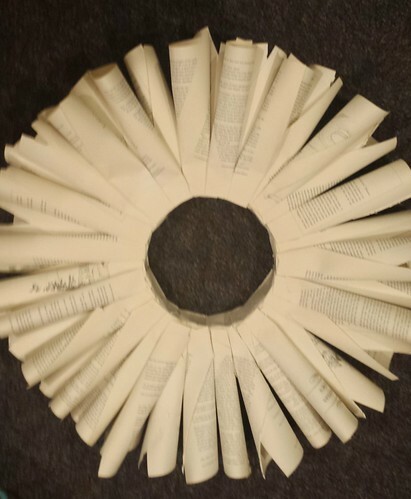 This week, I began forming paper cones from my smaller book and attached them to the inside rim of the wreath form (about 2-3 inches in). This served as an interior boundary and was a good gauge for how much work I had left to fill in. 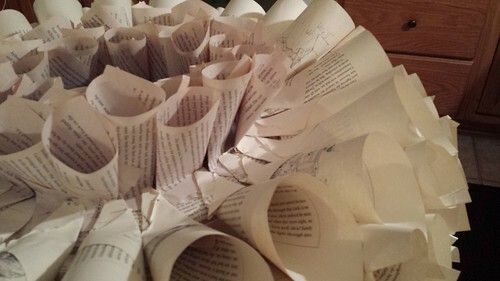 Again, because I was aiming at a full version of this project, I was generous with the paper cones. 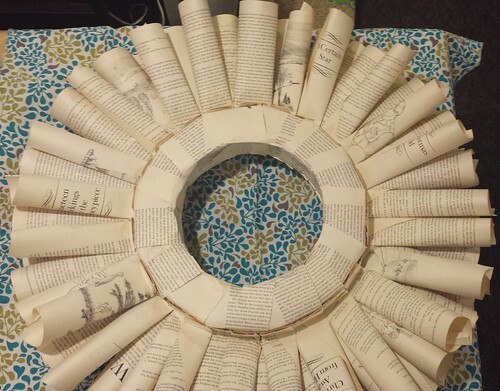 Once two inner rounds were complete, I used the remaining pages of my larger book and hopped back to continuing the outer rim. 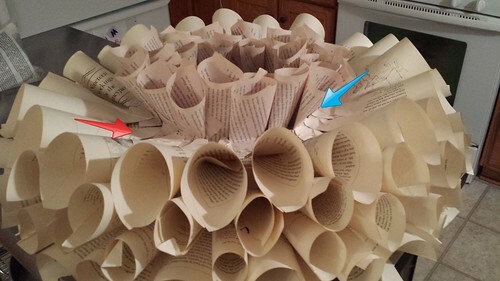 I ran out of pages in the large book before I was able to complete the round, so I just layered in shorter cones where that gap was by gluing the barrel of the cone to the adjacent cones. This project is very forgiving! 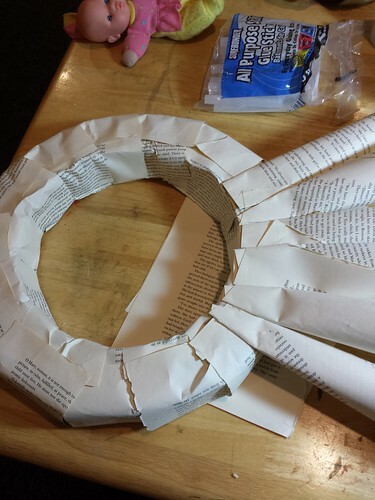 Working on the second interior row, I found it helped to bend the point up 1-2 inches and secure it to the wreath form with hot glue (see blue arrow). 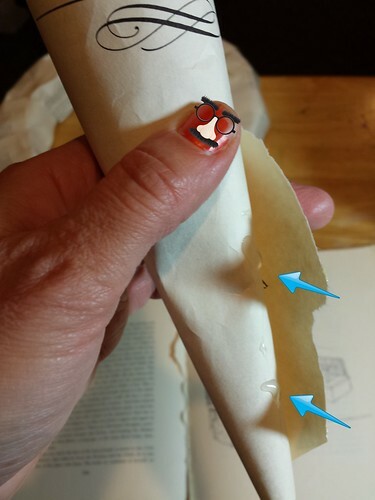 For the ongoing outer rows, I kept the cones straight, laying them where I wanted, then securing with glue on the point and barrel of the cone (see red arrow). I thought this might take time, and it did! I broke the "rule" and worked on it for about 1 hour and 20 minutes in order to complete it. 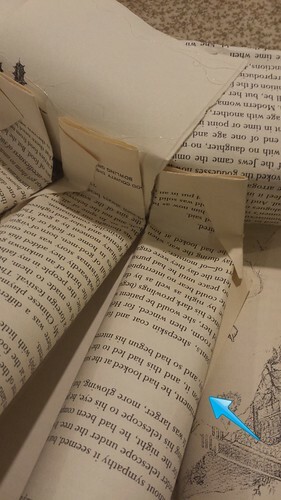 But it wasn't bad...just kept layering in and gluing cones from the smaller book. Once it was all filled in, I wiggled a length of tied kitchen string through some of the cones on (what would be) the top of the wreath and secured it in order to make a way for it to hang. No rocket science here. I then trimmed up any stray pages. And there you have it, a big effect with little cost and little time. Please join us in December for some special posts on Advent: Expecting and Sharing Jesus! How are we already on the third Friday of November! 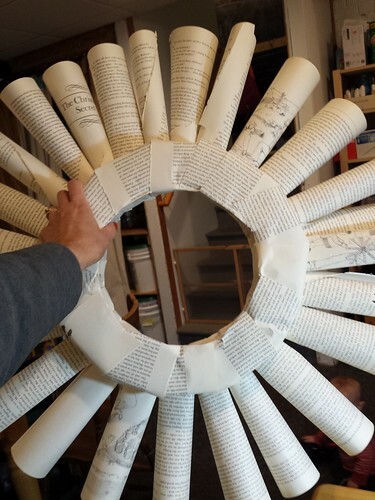 Welcome back to week 3 of Deck the Walls: in which we attempt to make a wreath from cast-off books "together." Here is the skinny from previous weeks: Week 1, Week 2, and a few guidelines below. 1. Limit the making to one day per week, no more than 30-45 minutes (unless you want to). 2. 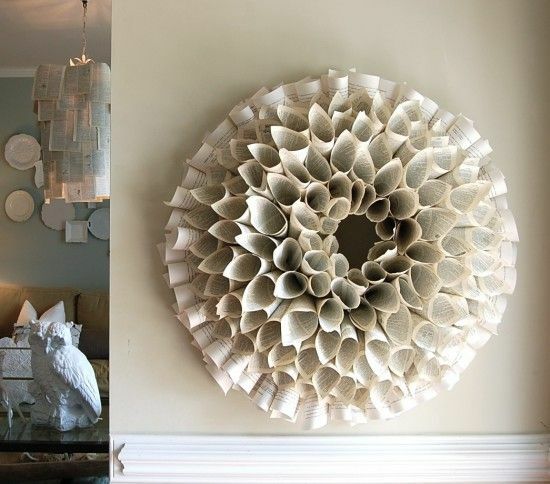 Use up-cycled supplies or minimally costed materials. 3. Keep your sense of humor on hand. 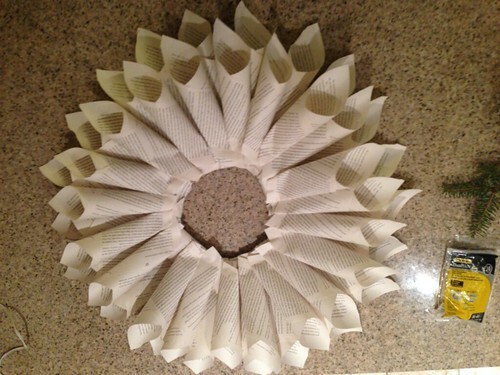 This week I filled in the gaps on the back end because I want a very full version of this wreath. You certainly can do as you like. So with the back complete, I turned and worked on the next row of the front side. In order to create a gradual decrease to the front center, I trimmed about an inch off the ends of the next set of cones. I found that then folding the ends of the cones up about 1-2 inches gave me a base to secure them with glue onto the wreath form. For any wayward cones, a shot of hot glue on the cone helped settle them down. I tried to place them between the gaps to continue to fill out the wreath. I wasn't aware that our comment section cannot receive a graphic, so if you would like to share your progress (and we hope you will!) you may email photos to erikashare@roadrunner.com, and I will see that they are added to our final post. Thanks so much! These picts are from Aleaha. I love the pointed pages and she said she's had some fun making it. Thanks Aleaha, it looks great! 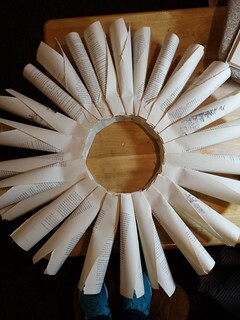 Here we are for week 2 of Deck the Walls: where we make a Book Page Wreath "together", investing minimal cost and time. You can find out more from week 1 here. In a nutshell the guidelines are: 1. Limit the making to one day per week, no more than 30-45 minutes (unless you want to). 2. 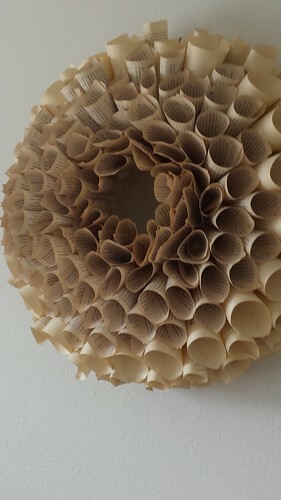 Use up-cycled supplies or minimally costed materials. 3. Keep your sense of humor on hand. And here is an inspiration photo below for what one might end up looking like. 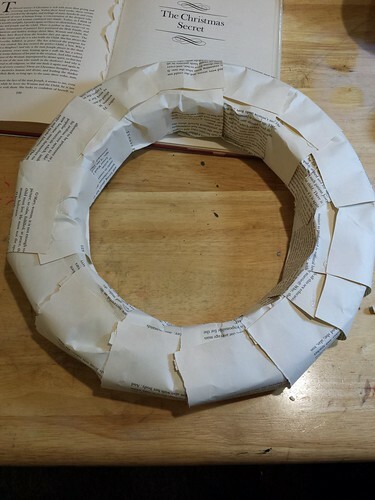 I worked on my wreath for one 40 minutes session. 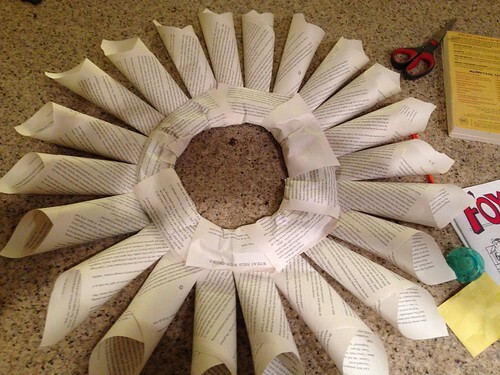 I was a little clunky with the glue and paper-cone making at first. I only got .5 burns on one finger...that is, an almost burn. But after a little fumbling, I did get better at it. 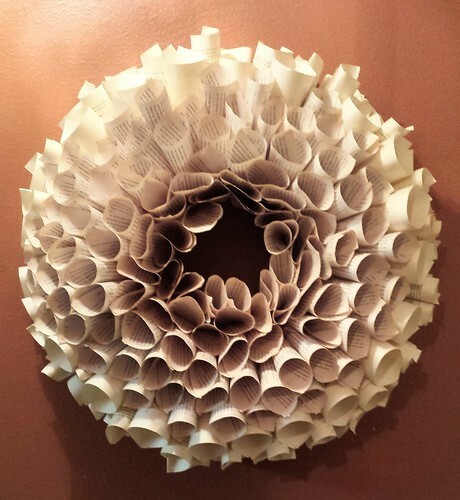 I chose to cover my wreath form with paper to ensure no green Styrofoam would peek through. 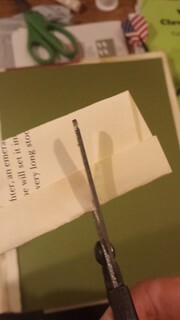 I cut my pages in half length-wise to have better control of the paper and not rip it. You will need to do whatever works best with your book size if you choose to do this step. The book I ended up using (not the hymnal) was a ten cent book from the library clearance shelves. 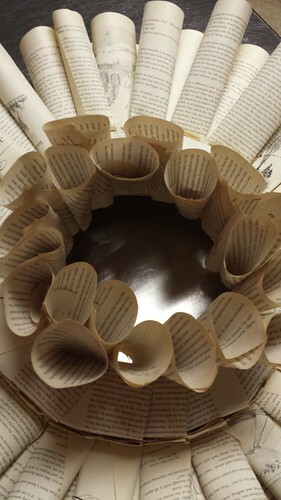 Flatten and glue the narrow end of each cone concentrically around the wreath form. It looked like this when finished with that step. This is the back side of the wreath. In order to make it look more full, I might focus on filling in the gaps (overlaying more cones to fall between the existing ones). Here is what it currently looks like from the front. And for a first week, I think it went fine. I will definitely need a second book as I am quickly running out of pages. Think I will use a smaller book size in order to make a gradual decrease to the front. So, that's it. Will be back next Friday with a little more done. Won't you share a photo in the comments if you are participating? Even if not, I hope this has added a little bit of fun to your week.